Gluten-Free Dan Dan Noodles! 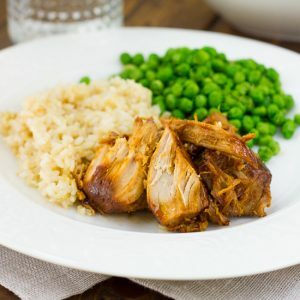 A 20-minute, kid-friendly dinner that is perfect for busy weeknights! I love 30-minute meals (or in this case 20-minutes!) that are full of flavor, kid-friendly and satisfying for a busy weeknight. 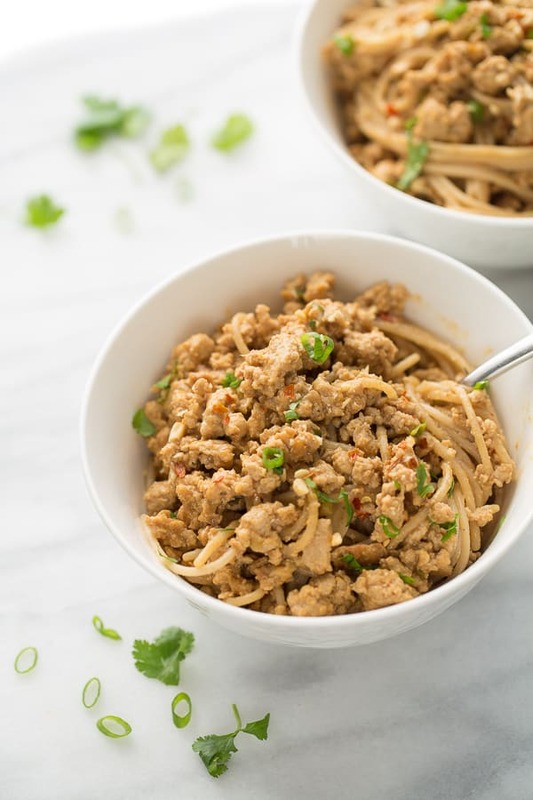 These Gluten-Free Dan Dan Noodles are just that! I used to love the Dan Dan Noodles at PF Changs and while PF Changs has a great gluten-free menu, the Dan Dan Noodles are sadly not. 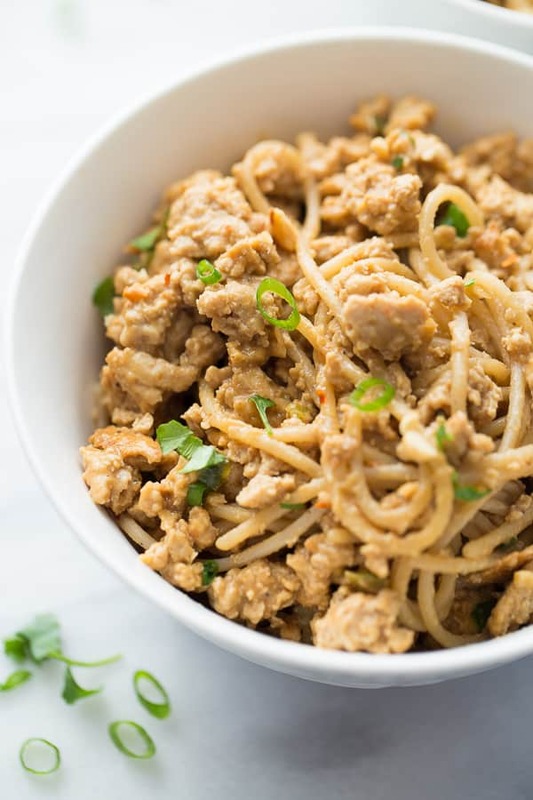 I make this version of Dan Dan noodles with ground turkey to keep things a little lighter. I also use gluten-free spaghetti (my favorite brand is Jovial) and you’d never know. The whole dish is tossed in a flavorful peanut sauce and topped with some chopped peanuts for crunch. Yum! I love that asian-inspired dishes are usually naturally dairy-free as well. 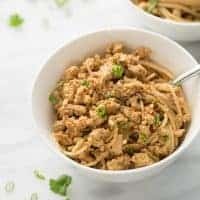 My kids go crazy for any kind of Asian noodle dish and always gobble these noodles up. 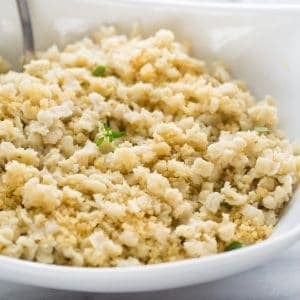 I like serving this with some steamed broccoli or sauteed veggies for a well-round meal since the noodles themselves don’t have any vegetables. Another one of our favorites that I’ve made on my instagram stories recently is the Soba Noodle Stir-Fry (I actually make it without the salmon all the time too) from this recipe. I’m always in need of more quick, dinner ideas and I hope you like this one! A 20-minute meal packed with flavor that is perfect for weeknight dinners. 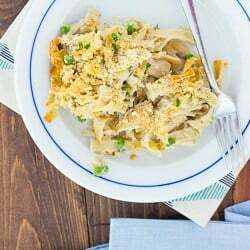 My kids love this meal and I like serving this with steamed or roasted broccoli. Cook the gluten-free spaghetti according to package instructions while you make the turkey/sauce. Whisk together all the ingredients for the sauce in a bowl until evenly combined. Set aside. Heat a large skillet over medium-high heat, add the turkey and sprinkle with the salt and pepper. Brown the turkey, breaking it up into small pieces as it cooks. Once the turkey is cooked, add the green onions, ginger and garlic. Cook for 1-2 minutes until fragrant. Add the sauce and stir to combine. Cook for 4-5 minutes until the sauce comes to a simmer and starts to thicken slightly. Add the cooked spaghetti and use tongs to toss together. Serve immediately, topping with cilantro and peanuts. Enjoy! MAKE IT SOY-FREE: Use coconut aminos in place of the tamari. MAKE IT PEANUT-FREE: Use almond butter in place of the peanut butter. I think my kids would go crazy for this as well and this MOM loves that it is made in 20 minutes! Seriously love quick and easy dinners! They are perfect for even the busiest weeknights. This was absolutely delicious! I cannot wait to make it again!! !